Manufacturers and dealers of farm and agriculture equipment know the Internet is a game changer when it comes to generating leads and sales. The Internet expands any agriculture manufacturer’s reach, allowing them to reach new customers, improve engagement, and convert leads into customers. The farm and agricultural equipment industry is one of a handful of industries where investments in equipment and machinery typically come at a high cost. Consequently, marketing any company in this niche comes with unique challenges and strategies. As such, you need a proven partner with knowledge and experience in marketing farm and agriculture equipment dealers and manufacturers. Russell’s Group is proud to have a strong track record of working closely with farm and agriculture equipment dealers like Caterpillar and more. Our years of experience working with construction, heavy equipment, as well as farm and agriculture equipment firms have taught us what strategies work, what doesn’t, as well as how best to reach your audience. If you’re looking for a reliable and experienced digital marketing team with proven experience in generating qualified leads and conversions for farm and agriculture equipment manufacturers and distributors. Russell’s Group is proud to be at the forefront of helping multiple firms and dealers in the agricultural equipment industry tap into the power of the Internet. We pride ourselves on our industry knowledge and insight into on marketing farm and agriculture equipment companies online. We are familiar with the unique online buying patterns and needs of audiences in this niche, putting us in an excellent position to answer your digital marketing needs and provide outstanding results. equipment or agriculture equipment manufacturer’s or dealers website. Russell Group relies on proprietary SEO Audit and Competitive Analysis, giving us insight into the current effectiveness of your website, as well as your customers and competitors. With this information and expertise from being a Google Partner, we will work to put your site on the first page of the Google search engine results pages (SERPs). Display and Remarketing Ads – The display and remarketing approach can be dangerous if your campaigns don’t target sites with the best value prices. When left to ‘default’ settings, your ads may end up showing on the wrong states/regions and sites, causing to waste money on junk clicks. At Russell’s Group, our proprietary processes and tools, combined with your certified and experienced team of digital marketers, allows us to give your farm and agriculture equipment company the best conversion rates at the most cost-effective prices. Social Media – Is your company not maximizing your presence on social media networks like Facebook and LinkedIn? Russell’s Group has run campaigns for farm and agriculture equipment firms on both platforms, giving us valuable insights on how to effectively leverage these networks. Email Marketing – As a farm and agriculture equipment manufacturer and distributor, you know your customers rarely make purchases in just 10 minutes or less. We know that your clients need to be nurtured along the buying cycle. Our goal is to design personalized email marketing campaigns to generate leads, and in turn, convert these leads into customers. As a Certified Google Partner, Russell’s Group specializes in building Google PPC Campaigns with high returns. Big PPC Campaigns with high returns. Your farm and agriculture equipment company can reap the benefits of digital marketing right now. 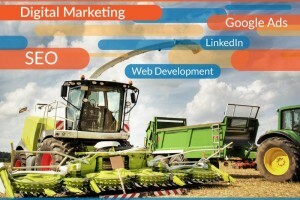 Let Russell’s Group help you by creating a digital marketing campaign specifically designed for farm and agriculture equipment and machines. Call us at (502) 222-8099 to learn more about how our services can help you.